Found this one at the Bet-R store a while back... I was surprised to see it, and it didn't have a price on it (must have just been put out) and they rang it up for $4.29. After seeing some pricing info and such apparently I got a steal, should have bought more! This will be the first BMC (that's Bud/Miller/Coors) product I've talked about individually on here, but in general I think Blue Moon does a pretty good job with their beer. They are what they are, a cheap American belgian-style wheat ale... not great, not bad, very drinkable beer and something different than the macro lagers. 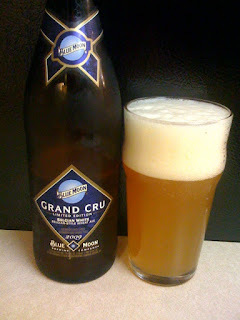 So, time to give this Blue Moon specialty a try. I poured it into an imperial pint glass, hazy orange-melon color with a frothy white head... good retention and lacing. So far so good! Smell is a bit muted, but there is definite wheat in there, as well as hints of spice. Nothing stands out, though. The taste is better than the smell, the spices really come out, bitter hops on the end after the coriander and orange rind. I'll be honest, I'm impressed by the taste of this one, and it really has a good mouthfeel. I'll admit I was skeptical, but I'm really glad I picked this one up. I'm by no means going to rush out and buy a case, and it's not the best witbier I've ever tried, but not bad. Not bad at all.